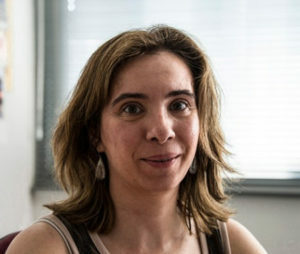 María-Angeles Pérez Ansón is currently Associate Professor at the Department of Mechanical Engineering, University of Zaragoza, Spain. She obtained her PhD in Computational Mechanics at the University of Zaragoza in 2004 with a thesis entitled simulation of cement deterioration and interfaces debonding in cemented hip implants, and it was award with the Best Technical Thesis of that year by the University of Zaragoza. She was a post-doctoral fellow at the Trinity Centre of Bioengineering (Trinity College, Dublin, Ireland) in 2004-2005 and at the Ecole de Technologie Superieure of the University of Quebec (Montreal, Canada) in 2007. She is a member of the I3A (Aragon Institute of Engineering Research). Her present research mainly focuses on Computational Modelling in Mechanobiology (mainly mechanics of hard tissues, design of prosthesis and implants), mechanobiology of skeletal tissue regeneration in healthy and pathological conditions (for example osteoporosis), non-linear finite element analysis and multiscale analysis. She is an author of 40 publications in peer- reviewed journals, several chapter books and more than 100 Contributions to International and National Conferences. Now, she was President of the Spanish National Chapter of the ESB between November 2011 and October 2013.